OK, so we're all changing over to this thing, but WTF is going on in the UI? I mean, seriously, I've finally given up finding the docs. The logger is always empty, the colors are weird, the two columns aren't documented or labeled, AFAICT, and the icons are generic and don't do anything that I can see. I agree it isn't the most user friendly, but the quality makes up for it. Damn, there's a Wiki right there, with it? They need to make better for SEO. I've been searching for awhile, now. Google and DDG consistently turned up nothing. I went back to AdBlock Plus. uBlock was blocking everything, every other website didn't work. I suppose I could have figured out how to tweak all those settings and lists but how much time am I supposed to spend on an ad blocker? I guess that depends on how much slow loading and flashy pages annoy you. uBlock and uBlock Origin block 1st-party content by default, which Adblock doesn't, but is otherwise similar (allow 1st and 3rd party scripts by default, and its behavior should mimic ABP--of course, it helps knowing which of those columns is which), with subscriptions. I find selective whitelisting, or just not viewing a page if it relies on too many domains, to be a lesser evil. See the "-" next to domains connected, and requests blocked? Try clicking where those would be, and see if it pops open. There's a "+" there, normally, that opens that panel. Yeah, I don't get it with the colors, but it's the same in two browsers. Just make the filter lists the same between the two and they'll behave exactly the same (save for strict blocking which normally isn't an issue). I've been using uBlock and uMatrix forever now so I can probably answer any questions about either of them. A big problem I had with origin was that Avira quarantined the xpi extension (malware). So I had to switch to Aljoudi's version. Edit- Just dl'd Gorhill's ublock again and it checked out ok on virustotal and Avira. First time I'm ever hearing of this issue. ublock has been perfect for me. That's the problem I had with the Origin version. I did not experience that with the Origin version either. Perhaps it was a temporary issue or even limited to a third-party filter -but it could not have lasted long since updated frequently and still well reviewed. FYI: the left pane popout requires checking the advanced user checkbox in options. The odd colors are from my checking basically everything, in my poking around. It's the colorblind setting (I can actually thank an accident with the Lazy Newb Pack for discovering that one). It took me a lot of bravery to finally dump Adblock Edge and especially "Element Hiding Helper" and switch to uBlock origin. While I think the uBlock origin UI is horrible, non-intuitive, buttons etc. without a description etc. 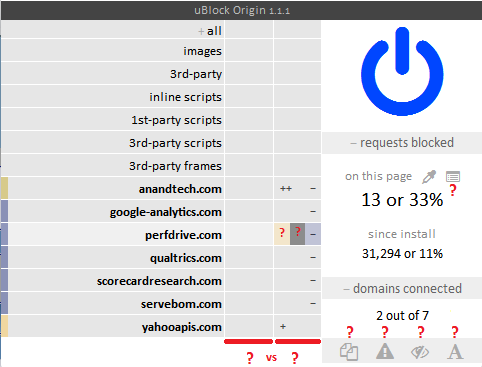 I am surprised how well uBlock origin blocks "out of the box". In three or so weeks I had no reason to add any custom rules. It blocks a lot more than ABP did. Windows 10 caching network documents?